Combine a genuine passion for property, a peerless commitment to client service and an unmatched level of enthusiasm and who do you get? Ask almost anyone in the Hurstville area, and most will answer: Mele Gong. As a highly successful licensed agent with many record sales for clients in a broad range of suburbs including Hurstville, Carlton, Kogarah and Allawah, Mele is today well known in the local Chinese community with a large database of overseas contacts and is rated the Top Agent in the Hurstville area. 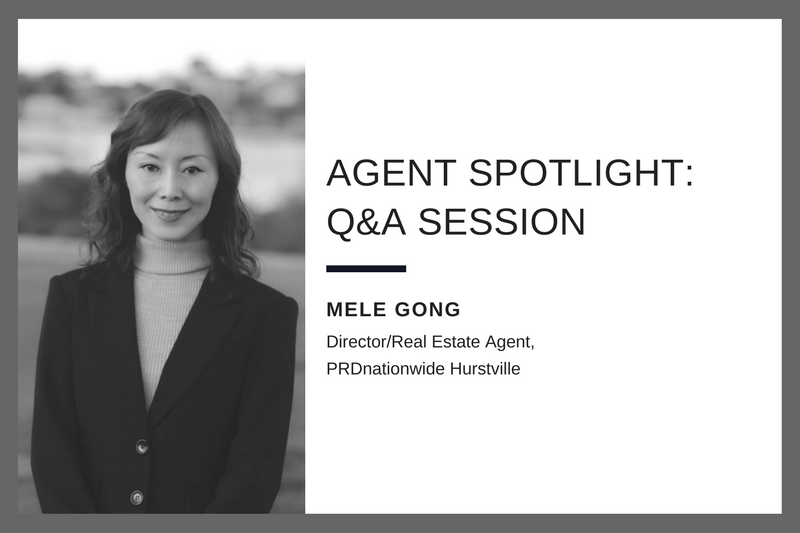 This month, we sat down with Mele Gong of PRDnationwide Hurstville to learn more about what it’s like to be one of the top agents in Hurstville, NSW. Read on for Mele’s story and the great advice she had to share. PRDnationwide: Tell us a bit about yourself. Mele: Once I found Real Estate I realised it was the career for me, I found so much passion; Real estate changed me and my life. In this industry, I am surrounded by successful people; I feel more positive and stronger than I did before being an agent. Since PRDnationwide Hurstville opened the door in July 2017, I have been working with my fantastic team, so it feels like every day is a new day, we keep learning from each other and make progress every day. PRDnationwide: What do you love about your job? PRDnationwide: Did you find it hard to break into a male-dominated industry? Mele: I do not feel it is a male-dominated industry; I think in this industry there is no difference in being male or female. It comes down to being passionate to help vendors’ goals in selling. It is all up to the person, not gender. PRDnationwide: What is the driving force behind everything you do? What keeps you motivated and driven on an everyday basis? PRDnationwide: Who are your female icons? PRDnationwide: What was it like to sell your first home? Do you still feel this way when you close a sale? Mele: Yes, I try to create a win-win situation – maximise the price for the vendor but also make sure the buyer finds their ideal home. I felt like a great achievement to sell my first home, and I feel this way each and every time. PRDnationwide: What is the market like in Hurstville? Mele: Hurstville has more and more properties on the market, the market is starting to slow down currently. PRDnationwide: What in particular led you to join PRDnationwide? Mele: PRDnationwide is a well-known and respected brand which is why I chose it. We have several PRD’s in the St. George area and we all work together to achieve the best results for our clients. John Bockos our PRD Business Consultant and the PRD Corporate team have continually provided us with support since opening. PRDnationwide: What are the challenges you and your clients face in your area – for buying/selling properties? Mele: Oversupply of units and buyers affordability are challenges in the area due to bank restrictions and economy. PRDnationwide: What’s your advice for the buyers and sellers? Mele: Make a decision based on your life – not based on the market, sell or buy properties when you need to, not when you feel the market is good or not. PRDnationwide: What’s your advice for other aspiring female sales agents looking to find success in the real estate industry? Mele: Every day I face many challenges; I keep updated with new knowledge and technology. Real estate is not just a career; it is constant self-improvement.